Directly evolved from the Carro Armato 8ton of 1935 vintage and of similar dimensions, with the same diesel engine and 37mm gun. It differed in having superior sprung bogie suspension, the 37mm gun remaining in the superstructure. Impetus for its adoption came after early operations by Italian-equipped Nationalist forces in the Spanish Civil War in 1936 had shown up the inadequacy of the little CV 35 light tanks. A redesign of the Carro Armato 8ton prototype was ordered, Ansaldo and Fiat being asked to build 100 of the new vehicles under the designation Carro Armato M11(8T). First deliveries were made in early 1939 and were completed by 1940. 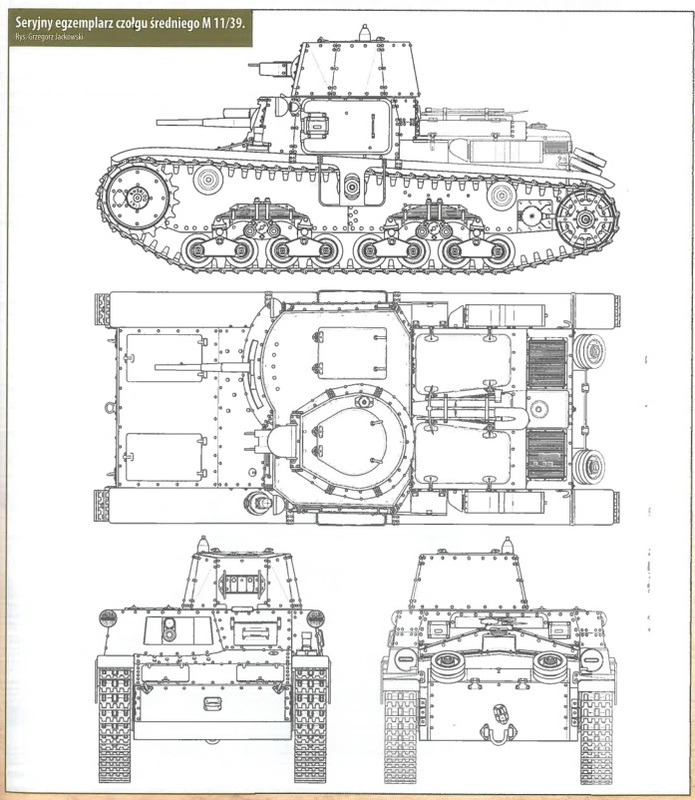 The M 11/39 was of riveted construction with rear engine, front drive, side access doors, and the manually operated turret was offset to the left. There was a stowage box formed within the hull at the rear. 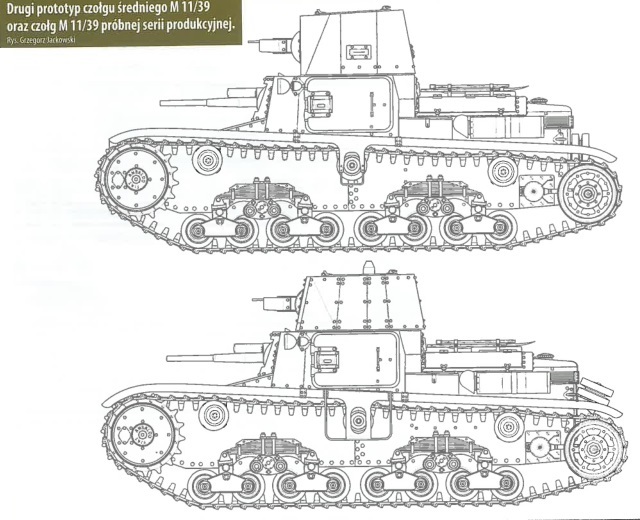 Owing to its very light armour and small size the M 11/39 was obsolescent by the lime it went into action in Libya in 1940. Many vehicles were swiftly knocked out and the type was withdrawn from service early in 1941. 11tons; crew 3; 37mm gun plus 2 MG; armour 6-30 mm; engine (diesel V8) 105hp; 21mph; 15.5ft x 7.08ft x 7.33ft. Other users: Few captured and used temporarily by Australian forces in the Western Desert, early 1941. A handful of surviving M11s were used at Tobruk – a brisk Italian counterattack there being led by a few M11s. There were 9 M11s in running order inside the fortress, forming what was left of the 1st Battalion, 4th Tank Regiment, under Capt. V. La Rosa. Most officers of the Battalion were killed or wounded in action. An M11 platoon instead was employed in the Derna sector, January 1941, against the advancing Australians of Robertson’s brigade. According to the Australian Official History the tanks played practically no role in the battle as their crews were put out of combat by sniping fire while they were standing outside their tanks. 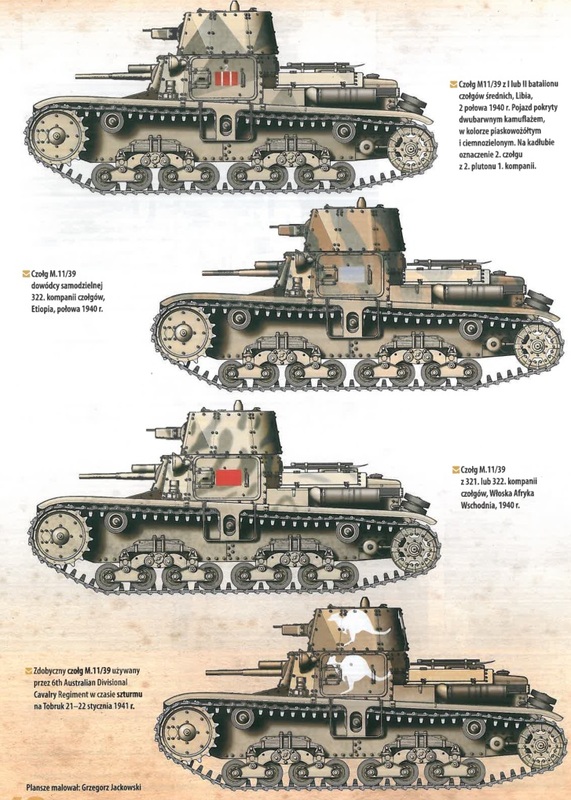 Additionally, my understanding of the organisation of the two M11/39 battalions in Nth Africa is three companies of two platoons of 5 tanks each and a platoon commanders tank and a battalion HQ company of 2 tanks making 35 tanks in each battalion. The 24 tanks in East Africa were two coys of 11 tanks and an HQ coy of two tanks. At the start of Libyan campaign, the Italian army have on hand a lot of L battalion and only two M11/39 battalions. This two battalion were: 1st and 2nd armoured battalion M 11/39 of 32. o Reggimento Fanteria Carrista of 132. a Ariete Armoured Division. They have a theoretical composition of 37 tanks (each) subdivided in two companies of 13 tank each. An Hq company with 10 tanks and a single Hq tank. For the Sidi Barrani offensive the Italian HQ grouped this two armoured battalion with other L battalion to form two provisional “ad hoc” “Raggruppamenti carristi” with this composition: 1. o Raggruppamento carristi with battaglioni carri L 21. o, 62. o and 63. o and 1. o battaglione carri M11/39 2. o Raggruppamento carristi with battaglioni carri L 9. o, 20. o and 61. o and 2. o battaglione carri M11/39 The 2. o battaglione carri M11/39 and the 60. o battaglione carri L 3/35 give, a company each to “Raggruppamento Maletti” to form a provisional tank battalion. After the Sidi Barrani offensive 23 M11/39 tank went to the divisional repair station for repair. At the start of December in Marsah Lucch the Italian HQ start to group some tank battalion to for a provisional armoured brigade. This one grouped: 1. o battaglione carri M 11/39, 3. o battaglione carri m 13/40, 21. o e 60. o battaglione carri L and some Bersaglieri and artillery units. At the start of Compass offensive, the 2nd battalion M 11/39 (with only 22 tank) was attached to “Raggruppamento Maletti”. The unit was entirely destroyed between December/9/1940 and January/5/1941 1941. The 1. o battaglione carri M 11/39 with only 5 tanks was detached to Ain el Gazala airport. All its “out” tanks went to Tobruk for repair. 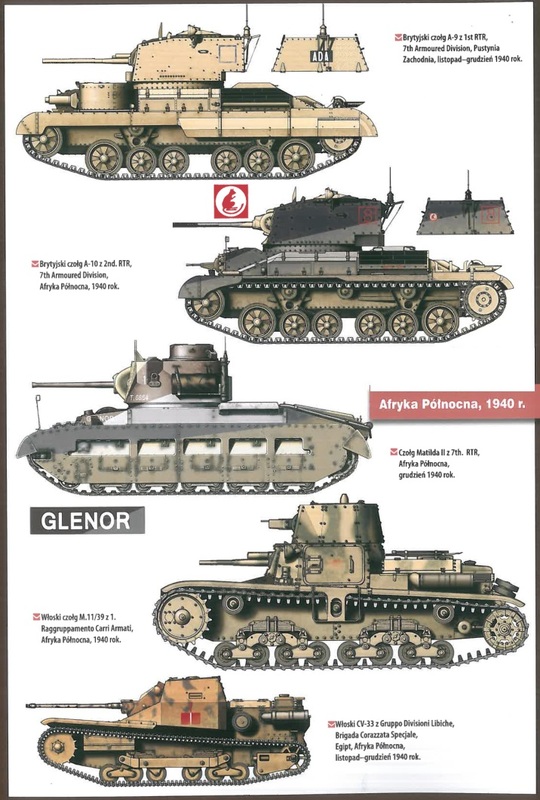 With the loss of Tobruck all these tanks were lost. After some days also the remnants of 1. o battaglione carri M 11/39 were lost. I believe 322a Compagnia carri M11 had some in service in AOI until May 1941. More or less. The Italian tanks at Agordat were L3 tankettes and a small number of M11/39s (there were 24 M11/39s in all in East Africa in June 1940). The tanks clashed frontally, with predictable results. There were many small scale engagements involving the M11/39 of 322e Comp., but I was thinking of its participation in the Raggruppamento motorizzato “Buonamico” (a hodge-podge of small motorized units commanded by Colonel Giuseppe Buonamico), and then with the 25th Colonial Division late in the AOI campaign. In late April 1941, General Gazzera ordered a diversionary attack towards Adama. 322a Comp. was part of this, with 10x M11/39, but the advance was stopped short. The column was exposed to air attacks, but apparently the tanks saw no serious action there. At the Bubissa river (11 May 1941), the M11 made a successful counterattack though (see Gazzera, p. 128). And later (19 May), near the Billate river, the M. 11 (reduced to 5) were involved in a fight against South-African troops. 25th Col. Division commander, Colonel De Cicco, was killed while riding upfront on a M. 11 (along with the crew); he was awarded posthumously a “Medaglia d’oro alla valor militare” (Gazzera, p. 103; Le operazioni in AO, II, p. 401). 322a Comp. disappeared at Soddu (22 may), along with the remains of 25th Col. Div. 24 were present at start of campaign along with 36-39 tankettes 10 were lost at Agordat (1 medium tank damaged /destroyed Bubissa hill after being hit by artillery fire May 1941 3 medium tanks captured at Colito 19 May 1941 6 medium tanks plus 4 tankettes captured at Soddu 22 May 1941 additionally 9 tankettes were captured at Dadaba 13 May 1941.